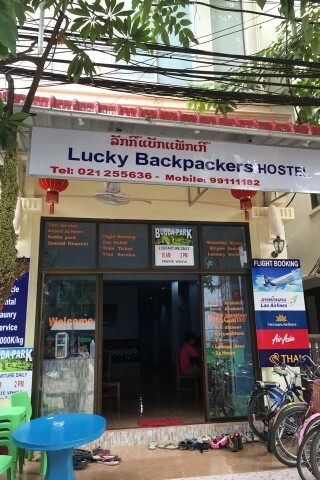 Lucky Backpackers is the latest addition to Vientiane’s hostel scene. Average rating 7.7 from 288 reviews. Opened in 2015, not surprising the new dorm rooms are far cleaner, fresher and better value than the same priced Vientiane Backpackers or Funky Monkey. Dorms are basic, and have the same style metal army bunks as the other hostels, with individual bed light and locker underneath. But you do get air-con at night, clean tile floors, a bit more breathing room, new linens and respectable hot water bathrooms. A friendly, smiley bunch run this joint – staff are welcoming and helpful. Breakfast is included (coffee/tea, eggs, toast) and in addition to WiFi, there are two computers that guests can use for free. Like the other hostels in town, the downstairs lounge is a great place to meet other travellers. The individual rooms with ensuite bathroom are just okay if you’re in need of privacy. The price and quality for those is comparable to Mixay Guesthouse , while Mixay Paradise and Sport Guesthouse are cheaper. Overall, the dorms are a fantastic deal for budget conscious backpackers. Check rates at Lucky Backpackers on Booking.com. 16-bed dorm. 50,000 kip for eight-bed dorm. Room: Dorm air-con, low season: 40,000 kip, high season 40,000 kip. Notes: 16-bed dorm. 50,000 kip for eight-bed dorm.